Flooding SolutionsDo it right, do it once. Guaranteed! Worried about Flooding? We can help. An Existing cellar or vault may become flooded due to seasonal fluctuations in the water table height or possibly broken underground drains. 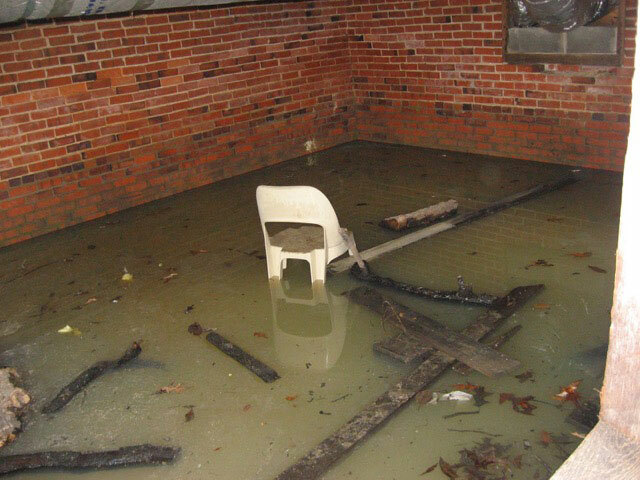 All property below ground level is at potential risk of water damage or total loss. We offer various remedial solutions depending on the type of ingress and the use for which the space is required for. Ground water removal pumps can be installed to remove the water present and keep it at bay. Waterproof membranes can be installed that offer a 100% dry and potentially habitable space. Many conversions from a wet cellar to an extra bedroom, utility room, study or bathroom have been achieved throughout London. Solve your rising damp problems. There is no doubt I've added real value to my property, with a touch of luxury too. Pro-Dry's efficient and professional team with their friendly approach, found the perfect solution. They truly went above and beyond to make sure I was happy - they did everything from the strip-out to the plumbing, heating, electrics, tiling and even painting. I cannot recommend them highly enough. Pro Dry's team was efficient, friendly and professional. Communication was excellent throughout what was a stressful period. They proved themselves honest hard working and good to their word. Once the job was started they worked through to completion. Their outstanding work has added value to our property. We can highly recommend them to anybody who faces the challenges of flooding and flood damage.